So this is basically a list of things on my personal wish list, lol! Who doesn’t love home spa gifts? One thing that I love about these types of products is that they are practical gifts that you can give that will get enjoyed and used and in the process the recipient feels pampered and loved. 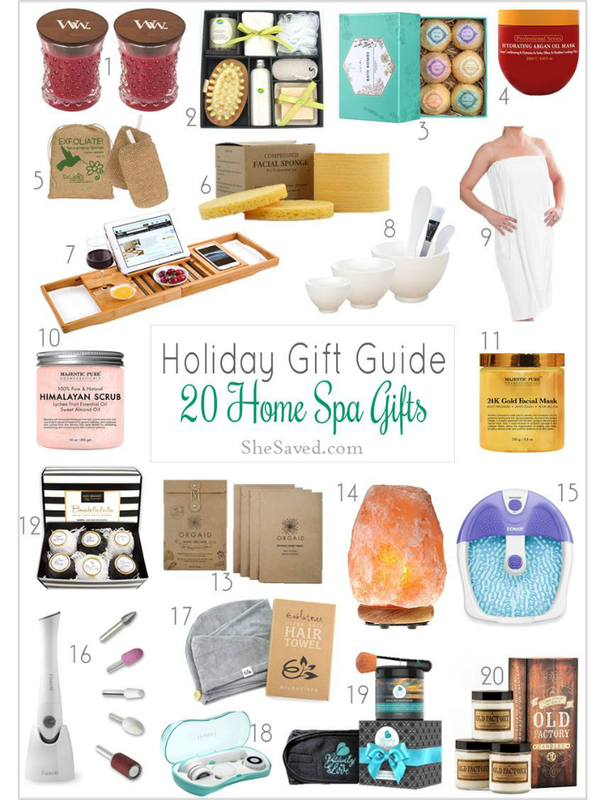 This list of home spa gift ideas should give you all kinds of ideas for anyone on your list who could use a little extra care and attention and it might also give you some ideas for gifting yourself, you deserve it! I’m a bit believer in self care and that’s really what spa gifts are all about, right? My personal favorite is the Himalayan lamp but there isn’t anything on this list that I wouldn’t love to receive as a gift and there are quite a few that I’ll be gifting to others this year. Looking for gift ideas for sports moms? Make sure to check out my list of gift ideas for soccer moms or gift ideas for football moms or gift ideas for baseball moms on your list, I’ve got them covered too!